Senior Abbie Kallner scored 15 points in Saturday’s marquee 56-50 win over West Carter (Ky.) at Ironton High School. 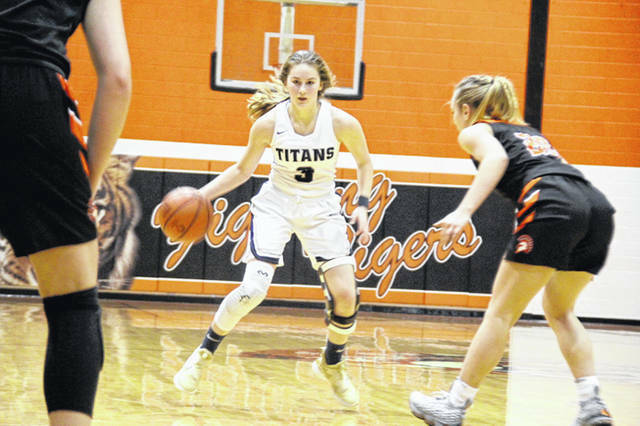 Notre Dame’s Ava Hassel has been a sparkplug for the state-ranked Titans’ offense all year long. PORTSMOUTH — Today gave us what we’ve all been waiting for: tournament brackets. The area’s girls teams now know their first-round postseason fates while the boys will find out theirs next weekend. While keeping that in mind, let’s take a look at this week’s Shootaround, ahead of another jam-packed week … one where the boys have one last shot at making an impression. A. Wheelersburg’s girls are starting to hit their stride. That last sentence may confuse some. I can see the question being posed, “Haven’t they already done so?” The fact of the matter is that the Pirates have won games this year. But they’ve also had major areas to improve upon … take their 80-39 loss to Vinton County for example. But Saturday, in a 56-50 win over West Carter (Ky.), coach Dusty Spradlin’s team put together a complete effort. When Abbie and Ellie Kallner are both hitting, as well as Kaylee Darnell, Alaina Keeney and Karlie Estep, look out. It’s scary to say but I think Wheelersburg’s best basketball still hasn’t been put on full display yet. B. I completely understand that Northwest’s boys record isn’t good. That’s just a fact. The Mohawks sit at 1-15 overall. However, there are positives within the program; one certainly being freshman guard Brayden Campbell … who put on one of the best defensive clinics I’ve seen in quite some time Tuesday evening. Campbell, guarding Huntington Ross’ Elijah McCloskey — a prolific scorer in the Scioto Valley Conference — was everywhere on the defensive side of the ball. He frustrated McCloskey all night long, holding him to seven points, and played hard for 32 consecutive minutes. Give credit where it’s due, and that’s to Campbell. C. New Boston’s boys continue to get better each night out and you have to think that, in a tournament sense, nobody wants to deal with Kyle Sexton and Tyler Caldwell with their season on the line. The Tigers, at 13-4, relied on Sexton’s 22 points in Saturday’s 70-63 win over Ironton St. Joe. But what’s more telling is that New Boston scored 70 points in a game where Caldwell scored just four. As more scoring threats emerge, namely Marcus Saunders and Grady Jackson, the Tigers only get that much better. That can’t be welcome news to postseason foes. Minford’s duo of Darius Jordan and Kelton Kelley are starting to turn heads. Kelley scored 34 points in two outings this week while Jordan continues to make the Falcons’ offense go. Since Jordan’s return to the lineup, Minford is 4-3. Without him, the Falcons are 2-8. South Webster’s Shiloah Blevins scored his 1,000th career point this past Tuesday in an 81-43 win over Northwest. Blevins, who was injured earlier this season, is one of the best players in the area. With him healthy, the Jeeps are a dangerous team to watch in Division IV. I know you already know this but I can’t stop raving about Notre Dame’s Ava Hassel. The sophomore point guard, pound for pound, is one of the best I’ve covered … ever. 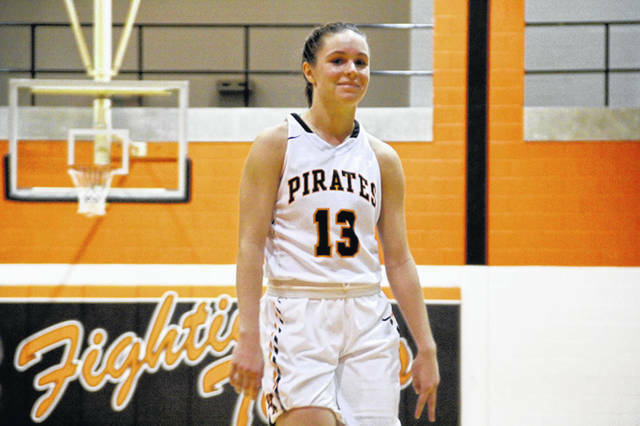 Hassel scored 11 points in Monday’s win over Oak Hill and nine in Saturday’s loss to Waynesville. But it’s the other things she does to make the Titans so much better. Grit, toughness and playing hard-nosed defense could all describe Hassel. We’re lucky to have her for two more years. Monday kicks off the final week of the regular season for area girls teams. That day, Clay travels to Eastern in conference play while Minford goes to South Webster for an intriguing matchup. Thursday, the Jeeps travel to Wheelersburg for the Pirates’ final conference test while New Boston goes to Western. On the boys side, Western visits Franklin Furnace on Friday for a tangle with the Bobcats, following the Bobcats road trip to New Boston on Tuesday, while South Webster makes the trip to Oak Hill. In non-conference play on Saturday, Greenup County (Ky.) pays Wheelersburg a visit.